High-tech hearing protection, complete with customized patches. Gear up for your next range trip! 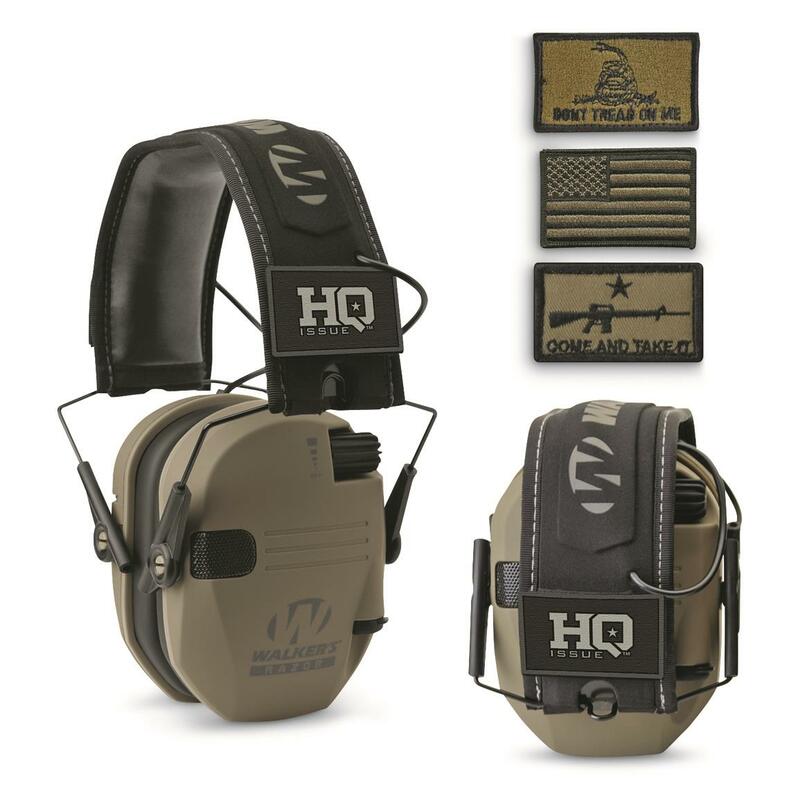 The HQ ISSUETM Patriot Series Ear Muffs feature a 23dB noise reduction rating and Sound Activated Compression Technology that protects your ears from loud gunfire, while still allowing you to hear range commands and other shooters. Ultra-slim, low-profile design fits comfortably around your ears and won't take up much space in your range bag. Show 'em your true colors! Personalize your Electronic Ear Muffs with the included Patch Kit! Patriot Patches attach securely to your Ear Muffs, giving you a unique way to show off your true colors. Includes HQ ISSUE patch, American flag patch, Don't Tread On Me patch and Come And Take It (AR RIfle) patch. HQ ISSUE Walkers Patriot Series Electronic Ear Muffs is rated 4.3 out of 5 by 7. Rated 4 out of 5 by Shoot from Great price The noise canceling headset works great. I would have given the whole experience 5 stars but it ended up on back order and then delayed for a few days after that. Rated 2 out of 5 by Carbinekid from HQ ISSUE Walkers Patriot Series I don't know if the HQ's are the same as the Regular Patriots? These are like wearing nothing. I was shooting at an outdoor range and the guy 4 tables down from me was shooting an AR 15, w/223 not 556 and I had to put ear plugs in with these, because it was hurting my ears. This was my first time with these, I have another pair, cheaper ones, from another maker that are alot better then these. The only cons. with the cheaper ones, is they cut in and out now and then. The Patriots look and sound great until a gun goes off next to you. The shot guns were being shot at the trap range about 500 yards away, were just fine. I came home and put some foam in the ear openings, we will see if that helps. Otherwise I'm sending them back. I hate to see how they sound at an indoor range. Rated 5 out of 5 by Crash from Good quality muffs for a good price Well made, comfortable and pretty good sound. Look professional and you can attach swag. I bought a second set for me (one in truck, one in range bag) and gave two for Christmas presents to shooter friends. Not as nice as $300 Sordins but at 1/6th price they are a great deal.Pros, single on off volume switch, sturdy, work on just 2 AAA batteries and the sound quality is pretty good, very good for the price.Cons, single on off volume switch (can't adjust each ear independently but it's a pro for turning them on and off) . No wind muffs over the mics so wind noise occurs when really windy.